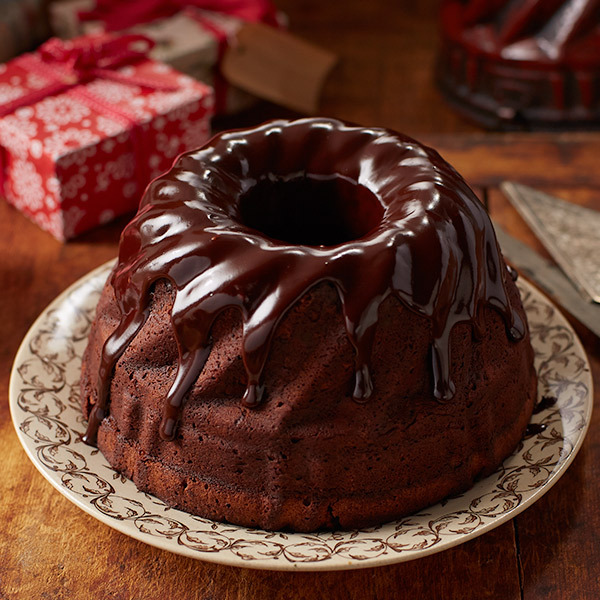 Choose this chocolate cake recipe for a seemingly innocent Bundt cake with a surprise Black Russian flavor. It is packed with intoxicating flavors, such as Kahlua and vodka, and time-saving shortcuts like chocolate cake mix and chocolate pudding mix. Your guests will think you spent hours in the kitchen creating this full and rich Black Russian Cake. A great way to impress and delight chocolate lovers any time of the year! Preheat oven to 350°F. Grease and flour Bundt pan. In a large mixing bowl, beat pudding mix and milk with whisk for 2 minutes. Add dry cake mix, eggs, oil, Kahlúa, vodka and water to pudding and mix until well blended. Add chocolate chips and stir with a spoon. Pour batter into greased and floured Bundt pan and bake at 350°F for 50 to 60 minutes or until a toothpick comes out clean. Cool in Bundt pan for half an hour and turn onto wire rack. Continue to cool on wire rack for another hour. In the meantime, make the glaze. In a microwave-safe bowl, heat the frosting for 30 seconds; stir. Heat for an additional 30 seconds and stir until frosting is smooth. Add Kahlúa to the melted frosting and beat with a whisk until well blended. Set aside glaze until cake is cooled (stir glaze again immediately prior to adding to cake). When cake is completely cool, put on a serving platter and top with glaze. Use remaining glaze as topping when serving cake (Remaining glaze can also be reheated and served warm over cake and ice cream).